It seems insane right now that, when the vast majority of us are headed for the poorhouse and/or debtors’ prison once our healthcare evaporates, some clueless marketers are still aiming to tap into the out-of-touch-with-reality market of the top one percent of the one-percenters. Cases in point: a $2,145 tote bag that looks just like the ones you can get at Ikea for a dollar, $425 fake mud-stained jeans, and now, a Prada paper clip that nears $200 with tax. 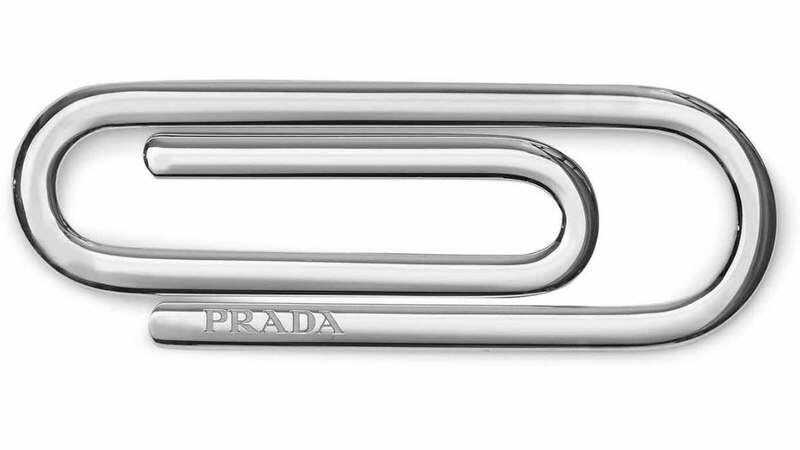 Prada, of course, is calling it a money clip, engraved with the company name, as CNN reports: Specifically, it’s a “sterling silver ‘paperclip-shaped’ money clip, which Barney’s is selling for $185. At 6.25 centimeters long and 2.25 centimeters wide, Prada’s magnum opus clocks in at just over $13 per square centimeter.” If you’re short of cash to even put in the clip, not to worry: Barney’s also sells two alternates for a mere $150 each.